Store all “food” properly at all times – DAY AND NIGHT: Make a conscious mental shift whenever you’re in bear country (pretty much anywhere in the Sierra). See below to learn what “properly” means in different settings. “Food” includes anything with a scent: That means trash, toiletries, recyclables, candles, first-aid kits, window cleaner, pet food, dirty dishes, dirty diapers, baby wipes, air fresheners, beverages, canned food, coolers (full OR EMPTY), mosquito repellent, lipstick, tobacco… seriously, anything with any scent. Really. Keep a clean car, camp, and cabin: Never leave “food” in the open and unattended. Plan ahead: Don’t wait until arriving at your campsite. Do you need to rent a bear canister? Is your car full of old food wrappers? 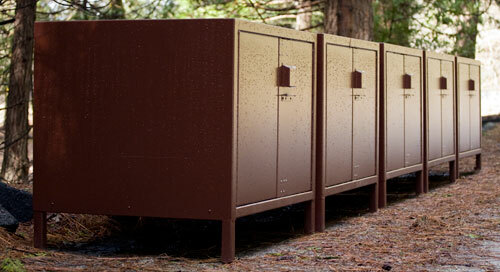 Are there bear-proof food storage lockers or dumpsters at your trailhead? Learn about area-specific food storage instructions: Read signs, listen to local employees, and ask other visitors. Regulations differ between areas depending on bear activity. Report all bear incidents to local officials: help land managers concentrate their resources on areas with the most human/bear activity. Follow the “Bear Essentials” listed above. Remove all those pesky scented items from your car before your trip: the apple core under the seat, the gum in the glove box, etc. Once at your destination, empty all “food” out of your car and place it in a bear-proof locker or dumpster whenever possible. Do not leave food unattended “just for a minute,” no matter where you are. Properly close and latch bear lockers, hotel doors, and windows. Check area-specific information for local instructions regarding bears. Carry an allowed bear-resistant container whenever hiking or riding into bear habitat. Pack your food container(s) BEFORE your trip to verify that ALL your food will fit. Plan ahead: Check area-specific food storage regulations. What backcountry facilities are available in the area? Which food storage canisters are allowed? Increase the capacity of bear canisters by packing efficiently. Want some backcountry food ideas?. Clean all “food” out of your car before you reach the trail. Some trailheads don’t have bear boxes or trash facilities. Check with each national park or forest for their specific list of allowed canisters. “Car Crunch”: Broken window glass, bent door frames, popped camper shells… all to reach that apple core you left under the passenger’s seat. “Trunk Trick”: An add-on to the basic “Car Crunch”.After breaking a window, the bear rips out your back seat to reach that toothpaste you left in the trunk. “Cat Burglar”: It’s not just cars: Leave the door or window open at your cabin or hotel room and a bear will happily rip through the screen to find that granola bar in your luggage. “Dinner Guest”: Now that steel bear lockers are common throughout the Sierra, some habituated bears resort to walking right into campsites during mealtime to grab food directly from picnic tables, open vehicles, and yes, open bear boxes! “Tarzan”: In the backcountry, bears climb to tree branches above a suspended food bag and jump onto the food bags, dislodging them en route to the ground.No really, they do.It’s crazy. “Scissor Teeth”: In the backcountry, some bears gnaw through ropes or branches to drop food bags to the ground. “Oscar the Grouch”: Some bears learn to paw open trash cans or dumpsters to pull out trash or crawl inside.Bears sometimes get stuck inside dumpsters and collected with the trash, either getting compacted and killed by trash truck machinery or injured when escaping the collection truck.Help prevent this by always latching the lid on dumpsters and trash cans. “Aquaman”: At least one bear in the Sierra is known to swim to reach rafts where food is being stored. “Desperate Dirt Bag”: Rock climbers suspending their food bags off the ground have lost their wall munchies to incredibly skilled free-climbing bear stone-masters.Food hung over the lip of cliffs has been pulled up and munched by bears on the summit.